cake extremes - making a statement at your wedding. Everyone loves the traditional three tier wedding cake with simple white frosting and the little bride and groom wedding cake topper. But how about some of these interesting custom wedding cake ideas. There are a ton of different wedding cake toppers on the market today, so you are no longer stuck with what your local bakery has. 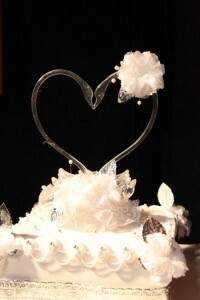 You can now easily shop online and find retailers selling a wide variety of wedding cake toppers. You can have anything from the traditional bride and groom to the whacky and wild. If you are willing to pay a little extra you can get a custom wedding cake topper sculpted out of special non toxic clay like material and created in the likeness of you and your husband or famous characters. If you are really into a sport or want to show something unique about the two of you as a couple then a custom wedding cake topper is the way to go. The artists can easily make a couple doing just about anything. So if you are avid rock climbers then you can have a bride and groom fashioned in your likeness that are on the top of mountain, or whatever sport or activity you like. If you don’t want to be that adventurous then you might want to go for a custom initials wedding cake topper. These are beautiful wedding cake toppers created from your initials , Whatever you choose there is a wedding cake topper either already made or that can be custom made to fit your wedding theme. If you just go to your local bakery or even a small wedding cake shop you are likely to just find the standard wedding cake offerings or the traditional cake. 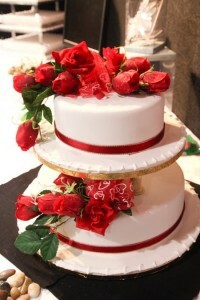 However, if you really want to do a wedding cake makeover ask if they can do themed wedding cakes. There are a wide variety of options for a custom wedding cake, here are a few ideas. If you are not sure about all of this and want to stick somewhat to tradtion then why not go for the traditional cake but add some flare to it through the decorations. Most wedding cake bakers can add a wide variety of different ornaments and decorations to the wedding cake to really make it stand out. 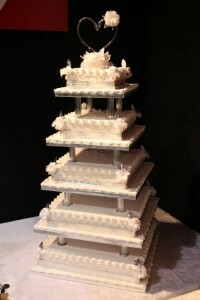 Sure you can go with the traditional shaped cakes like the three tiered circle or even a tiered square cake but that does not mean you can’t go a little crazy and get some interesting decorations put on it with unique icing ideas. Try to pick up on the theme of the wedding as much as possible. Now this is where a custom wedding cake baker really can show off their talents and the types of projects they often love to do. A baker who can do a sculpted cake might take a little time to find however once you find one you are only limited by your ideas. Do you want a big castle wedding cake? They can easily do this to make a fairy tale wedding cake. If you want a beach themed wedding cake why not get a picnic basket or a beautiful sand castle wedding cake. If you are contemplating getting a sculpted cake you can really have any three dimensional design that you can think of. The sky is the limited once you get a sculpted cake. Again if you don’t quite feel ready to make the commitment to such a grand cake like above and want to keep a little bit on the traditional side yet with a flair of fun why not try a mini wedding cake or even cupcakes. These are fun because they are small individual serving sized cakes that your guests will love. If you are planning on having a small wedding it can be a lot of fun to create personalized mini wedding cakes for the guests. Whatever you choose, remember there are options out there to customize, tweak, alter and change just about every factor of your wedding cake. Let you mind wander and have fun a bit and go for something a little different. Always make sure to plan ahead and leave enough time for the baker to do the extra job well. Otherwise you are all set to go with a fun and unique wedding cake that is a definite extreme makeover from the traditional three tiered wedding cake.